Yes, he did. Now... what's next? Barack Obama wins and effectively kills the Red State/Blue State Map for the time being. VA, IN, and, yeah, even NC are now true blue! Does that mean maybe the media will cool it with the cartoon, Joe Six Pack, hard workin' white guys spiel for the time being? We mean, c'mon, that ship has totally sailed. Cabinet and inner-circle speculation is running rampant right now. Hell, it's more fun than this election stuff anyway, unless you really want to parse over flag pins and plumbers again for another couple of months. (Uh, no thanks.) But since this was an election that was all about the economy, the media thinks that the most immediate vacancy to fill is the treasury secretary slot. We wouldn't be surprised if AG speculation replaces it next week, since the Bush gifts of Gonzales and Ashcroft left open wounds nowhere near healed. The Obama spin will be all about the perception of a new type of administration from the top down. Will that mean new and unexpected faces at every turn? Rumblings of the coming Civil War in the GOP have also jumpstarted. The real problem for them is that Bush has remade the party in his image of Salesman-in-Chief, and so far no one has seriously questioned whether or not they should improve their product-they seem to want just bigger and prettier billboards. El Rushbo and friends want to hit harder and become tougher. And, the defeats of moderates Chris Shays in the House and Gordon Smith in the Senate point to a hard right turn for the national party, now that their middlemen (haha, get it?) are in the wilderness. This is miles away from Karl Rove's dream message of a center-right permanent majority. Coming weeks will chronicle new stars who might take this opportunity to give the elephant's trunk a good tug, and, dare we say, in the process fire up the grassroots. With a new day for America comes a new direction for foreign affairs. While the world was overjoyed by the renewal of America's promise, Russia proved itself to be the bad dinner guest at the celebration. Obama's first challenge may be handling Putin's plans to re-ascend in a Russia bolstering its military ambitions. In this narrow window of time in which we have a President-Elect, it will be very interesting to see where this situation goes. Everyone wants a slice of the new-power-structure pie. Lobbying workshops that were burning the midnight oil before the election are now going into hyperdrive to get an ear and a voice for their causes. But it seems that American automakers will get their first crack at Speaker Pelosi next week in an effort to get the lion's share of bailout money; the enviro nmental community needs to act now so they can make sure their voice is heard just as loudly. 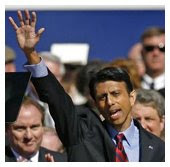 Louisiana Governor Bobby Jindal is visiting Iowa on November 22. Oh God... it's started!! Do people have to start donating their Facebook status to him already? Wonder if Sarah Barracuda has sat up and taken notice of Bobby's perambulations. Well, if the media didn't love Obama before, they have plenty of reason to fawn over him now. Election viewership was through the roof, and newspapers (remember those? We think Starbucks still sells 'em, or maybe the bookstore) were going like hotcakes the morning after. Will all this new attention and revenue lead our beloved media to continue to finance silly/awesome things like holograms (our Culture Minister's favorite, natch)? At least we can be sure that Olbermann will have enough hair gel to last him through the State of the Union. The TR's MVP award goes to Newsweek for their riveting quadrennial piece on how the Presidency was won. It was like I, Claudius for flacks. Usually we reserve our gloating for the Scorecard. But we'd like to point out how right we were about Hispanic turnout carrying Obama, AND how criminally this was underreported by the press. Luckily the almighty blogosphere picked up some of the slack. This is now the new demographic to watch, and we'd advise you to keep an eye on how immigration reform will play a new role in the new Democratic majority. To California's shame, Prop 8 passed handily. TR Central agrees with Kos in projecting that gay rights will take on a new vitality in the culture wars, even in our Brave New World. That many voters in the state split their ticket between Obama and the decision to ban gay marriage means, tragically, that even liberals can be persuaded to vote for discrimination if it's framed attractively enough. While many lawsuits are appealing the decision, the GOP will no doubt seize on this, one of its few bright spots. A new White House, of course, comes hand-in-hand with a new inner circle to craft the Presidency. Bush's backslapping-salesmen Texans are history; meet Obama's Chicago Mob. He's already tapped Rahm Emanuel as chief of staff, Bob Gibbs as press secretary and David Axelrod as senior advisor (the Rove hot spot), all tough and determined guys who know what they want. And don't expect the normal chaos of an incoming administration with John Podesta and Valerie Jarrett helming the transition team. Part of the transition will also include the first ever government website devoted to updating the public on the activities of the President-elect. From where we stand, this looks like the nascent period of what is sure to be a Presidency that will avail itself of the internet at every opportunity. 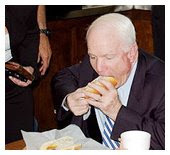 With the election now over and McCain happily grilling ribs in Arizona, it's revenge time for beleaguered ex-McCain aides -- fortunately for us (the fun don't stop!) and unfortunately for Arctic Barbie, it seems. Someone remind us, please: Is Africa is a country? Sigh... maybe we WERE being too kind these past two months. But we can stop this train before it heads into the next station: The Stop Sarah '12 movement has begun, starting with the people who worked for her. We do think, though, that "Wasilla Hillbillies" has sitcom potential. Finally, we want to send an appeal to the untold numbers of people who used the election as a pretext for finding love in all the wrong places: Do tell and satisfy the curiosity of our dirty (but discreet, we assure you) little minds. "Gee, there are only two things I'll miss after next Tuesday: 1) All those sleazy and entertaining nasty & negative ads on NY TV for races in NJ, and 2) The weekly Turner Report snarkfest on the week that was." Fear not, dear readers. While the campaign theater may be over, the political snark goes on - we can't help it, because, to our mothers' despair, we're just that kind of people. We promised an election based on strong economic messaging and the voters delivered in droves. We were wrong about Stevens, but almost take comfort in the fact that he and Palin get to stay in Alaska - might be too much punishment for one state to bear. Also, we said we'd see you at the recount but, heehee, we didn't say which! Go Franken! "One state to bear?" Don't you mean "one state to moose?"